simplicity, and a closeness to nature. 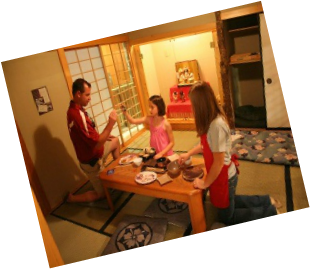 Stamp your passport and have tea in the tatami room or visit the kitchen and furo (bath) with its wooden tub. Japanese style toys and pretend to eat Japanese “food” with chopsticks provided in packages. Be sure to take your chopsticks home with you!